Bocce to the rescue! Woot! 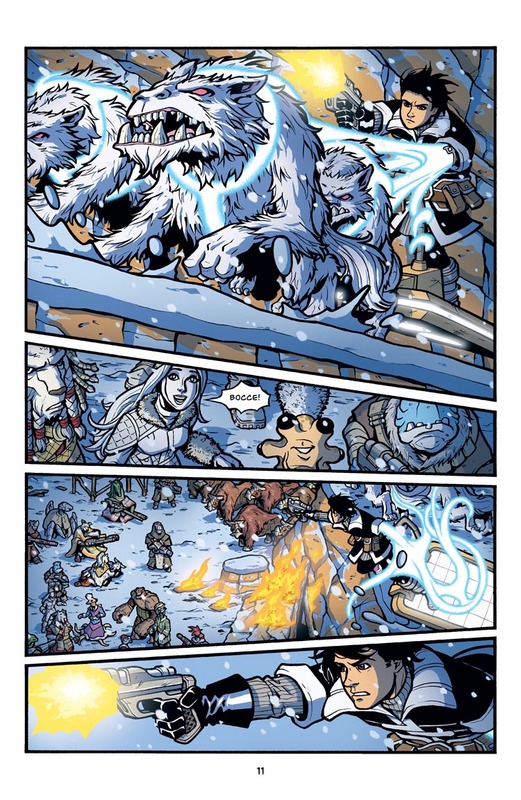 Here’s where it all comes together with Bocce, the alien wolf-dogs, and the lift sled from way back in The Big Snow Job #2, Page 2. As a minor detail, I think it’s pretty cool that Bocce is using the sled turned around, so that the bar normally used to push the sled is now being used as a handle bar as he rides it. And you get to see his arm in multi-function mode, which is always fun to draw. For those paying very close attention, you’ll see the ramp-like rock ledge in the background throughout the previous shootout sequence. I wanted to make sure it was established as part of the landscape so Bocce’s appearance on it wouldn’t seem to come from nowhere. Though I cannot help but think Roka will still get on Bocce’s case over the sled later – even if it is not broken, just scuffed up. i agree with exxos. the sled will get damaged and/or destroyed, and roka will chew out bocce, just for the comic relief in the end of the episode. Very cool! Great to see Bocce come to the rescue. I knew he was going to do us proud! Interesting comment about Roka chewing out Bocce about the sled. I do have some commentary about that but I plan to post it later. If I somehow forget, please feel free to remind me. It should be around page 21 or 22.